badged as Flexispeed, Norfolk and Simat, etc. First in a long line of variations on a common theme, the 'Ace Minor' by Perris was supposedly the product of a marketing company, Urquhart Machine Tools Ltd. of Clerkenwell, under whose label it received a glowing review in the January 1965 Model Engineer. 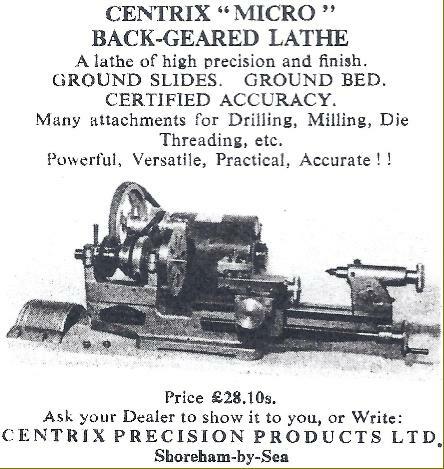 However, the same machine was sold as the Centrix 'Micro', ostensibly the product of the 'Centrix Works' of Centrix Precision Products Ltd., Shoreham-by-the-Sea, Sussex (which co-incidentally, was where Brian Perris started his own engineering firm in the early 1960)s. Despite the distributors' assertions that rebranded Perris lathes were their own products, Perris Engineering built them all, initially at Shoreham and then at 4 and 5 Meadow Rd. Industrial Estate, Worthing, Sussex. With a 0.5" x 16 t.p.i. BSF mandrel nose and two 0-MT taper sockets, the three PL90 variants were badged as the 'Ace Minor' and 'Centrix Micro': (a) plain-turning, (b) back-geared but without a powered leadscrew, and (c) 'horological.' The latter was wishful thinking for its distinction was a collet-holding spindle with unfortunate and significant design limitations. The two PL90 variants sold under the Perris name were called the 'PL90 Standard' and the 'PL90 Special', collectively known as the 'Perris Model Maker's Lathe', and characterised by a finer (0.5" x 20 t.p.i. UNF) spindle thread - the re-badged versions having the same two No. 0 Morse taper sockets but a 0.5" x 16 t.p.i. BSF nose.